Safer riding through real-time communication. The Smart Mic user interface is located at your fingertips, meaning you never need to dig the radio out of your pack to change settings. Includes radio base unit connected to Smart Mic. Designed to be worn with all backpacks. Optimized for use with BCA’s new line of Stash packs. 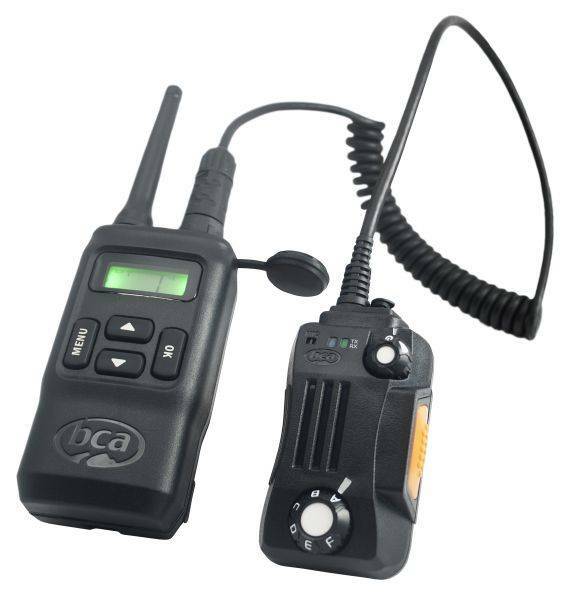 The BC Link is compatible with all FRS/GMRS radios (standard talkabout radios) and has a range of 2.5 miles line of sight with 140 hours of battery life. 22 FRS and GMRS channels + 121 sub-channels ensures minimal interference. Radio includes option for pre-set channel selections. Compatible with all standard FRS/GMRS radios. Designed to be worn with all backpacks. Secure cord connection and alligator clip for shoulder or sternum strap. Glove-friendly controls, optimized for easy handling. Rechargeable 3.7-Volt lithium ion battery provides long battery life. Base unit can be clipped to belt or stashed inside backpack. Love this products. Makes it so easy to keep track of everyone. Very good piece of equipment to have in the Backcountry. Awesome range, great battery life & can be used with helmet and gloves on! In love with this radio and use it every time I ride. The battery life is great and the range is awesome. My favorite part is that I can leave my helmet and gloves on and be able to communicate with my group. A must have radio, especially in the backcountry! Great battery life, awesome range, external radio thats affordable! Impressive range, Compatible with BCA packs, Great price & awesome battery life!